Siem Reap is quite a small town; walking from one end to the other doesn't take more than fifteen minutes - now if only it wasn't so hot and humid! Thankfully, there are tuk-tuks available everywhere. But be sure to negotiate. The drivers will quote $3, but will agree to $1 (in fact, we were left feeling that we should have quoted $0.5). Getting around the Angkor Archaeological Park is more of a problem, though. Angkor Wat itself is about 6-8 kilometers from Siem Reap town. Most of the temples inside the park are quite far away from each other too. Most people, especially when travelling as couples, hire tuk-tuks for the entire day. The tuk-tuk driver takes them to each temple, parks outside while they walk around, and then takes them to the next one. We also saw that some hotels had arranged minivans for their guests. Some crazy people had hired bicycles and were cycling around as well. Foreigners can no longer hire motor-bikes in Siem Reap, so that's not an option anymore. We hired our tuk-tuk with our hotel's help. 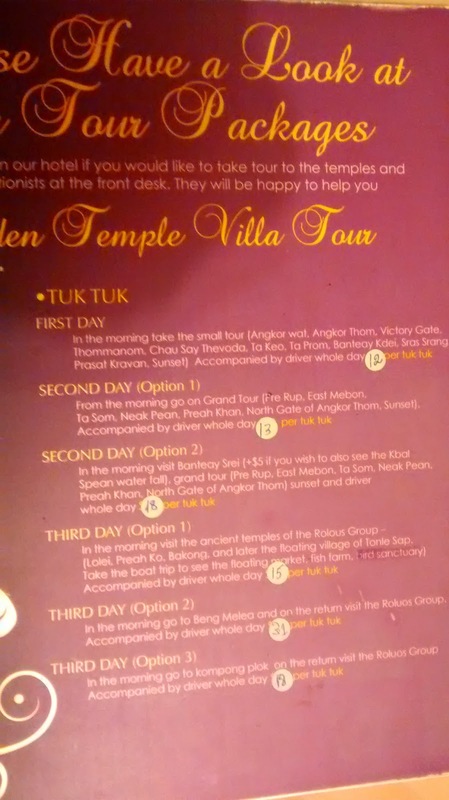 We didn't bother to negotiate, because many people on TripAdvisor had mentioned that our hotel had the cheapest tuk-tuk rates. Here are the rates, for what they're worth. The photo (click to enlarge) provides the detailed itinerary for each day. Out of these, the only day I felt we didn't get value for money was Day 3 - but that was for a whole different reason which I'll explain in a different post. Our driver was a smiling Cambodian who introduced himself as 'Phun' and dressed in formals throughout. When he saw us buying bottles of mineral water at $1, he took pity on us and offered to buy them for us at $0.5. He very openly told us that if we had lunch at the restaurant he took us to, he would be able to eat for free there. Unfortunately, we missed taking a photo with him and his tuk-tuk (red with a white canopy, what a happy sight it was at the end of each tiring temple visit! ).